Some foods are considerably healthier than others from a nutritional perspective, and certain foods are considered extra beneficial by health professionals and nutritionists. Black pepper is just such an example. Not only is black pepper a useful flavoring element, but it’s also a rich source of minerals and nutrients. Best of all, it’s easy to incorporate black pepper into your diet. Read this guide to find out more about this versatile seasoning. Black Pepper Defined Black pepper is actually a flowering vine indigenous to India that is grown for its fruit. When it is ripe, the plant’s fruit is dried and the peppercorn is born. You can buy peppercorns whole or purchase the product as a preground pepper seasoning. An alkaloid called piperine gives black pepper its familiar spicy bite. Some people grind peppercorns in a mill at home. Many prefer this practice because it usually produces a fresher, more flavorful seasoning. Black pepper has been a part of human culture for millennia, both as a flavoring agent and as a medicinal remedy. 1. Used in Ayurveda Remedies:- Many established societies use black pepper in a remedial way. Because of the black pepper health benefits, Ayurveda remedies frequently contain the seasoning. Black pepper—in combination with substances like castor oil or ghee—is used as an appetite stimulant, a breathing aid, and a cough therapy. It is also sometimes used to treat: #Colic #Anemia #Heart trouble #Diabetes 2. Keeps Your Food Fresh:- Black pepper contains antimicrobial compounds that help keep food fresh. Many anthropologists believe that peppercorns were a part of early food-preservation techniques. You can use black pepper in combination with salt to cure and flavor a wide variety of meats. 3. Reduces Inflammation:- Add a little pepper to your snack to help combat a headache. Interestingly, the piperine found in black pepper is an anti-inflammatory. Researchers recently studied piperine’s effects on pain perception as well as its anti-inflammatory and anti-arthritic effects. The results indicated that piperine blocked the expression of a gene responsible for arthritis and also reduced pain perception and inflammation. In short, black pepper contains a natural painkiller. 4. Rich in Vitamins and Minerals:- The nutritional content of black pepper is far more diverse than you might think. The innocuous-looking substance contains a generous quantity of vitamin A and is rich in vitamins C and K. Other vitamins and minerals in black pepper include: #Thiamin #Pyridoxine #Riboflavin #Folic acid #Choline #Copper #Iron #Calcium #Manganese #Phosphorous #Zinc 5. Antioxidants Galore:- Black pepper is also an antioxidant haven. Various studies conducted over the last quarter century show that increased antioxidant consumption has a positive effect on certain health conditions. One six-year trial, during which participants regularly took an antioxidant vitamin mixture, revealed a reduction in age-related macular degeneration. Antioxidant consumption may also reduce the risk of certain cancers as well as heart disease. 6. 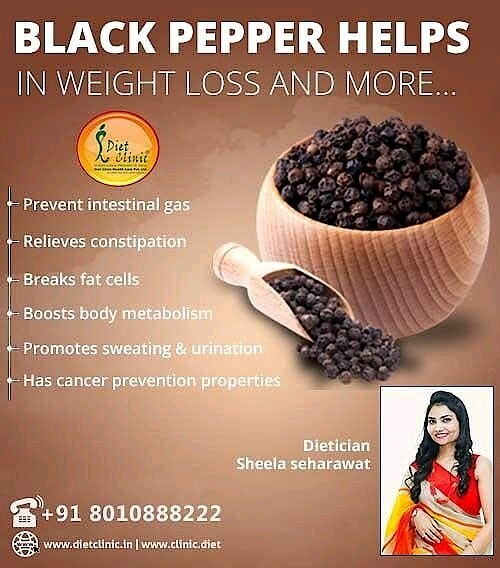 Enhances Nutrient Absorption:- Black pepper health benefits don’t stop there. Piperine, the compound responsible for pepper’s taste, also aids the absorption of other nutrients. Several recent studies have shown that piperine actually increases the bioavailability—and consequent effectiveness—of certain other substances, including curcumin. Curcumin, which is found in turmeric, may reduce the severity of several major diseases in humans, including pancreatic cancer, Alzheimer’s disease, and psoriasis. If piperine can help the body absorb curcumin, the combination could lead to new medical treatments. #Incorporating Black Pepper into Your Diet Believe it or not, there are a number of different types of black pepper, some of which are more potent and flavor-rich than others. Experts generally advise against purchasing preground pepper because the grinding process reduces a significant amount of nutritional content. If you plan to take advantage of black pepper health benefits, you’ll need those nutrients on your plate. #For best results, whole peppercorns are preferred. You can use black pepper as a remedy or a food additive, or both, if you want to. Pepper recipes vary from the mild to the adventurous. You can also add pepper to tea. The health benefits of black pepper tea are numerous and resemble those found in other pepper recipes. Keep your peppercorns fresh by storing them in an airtight container and away from sunlight.